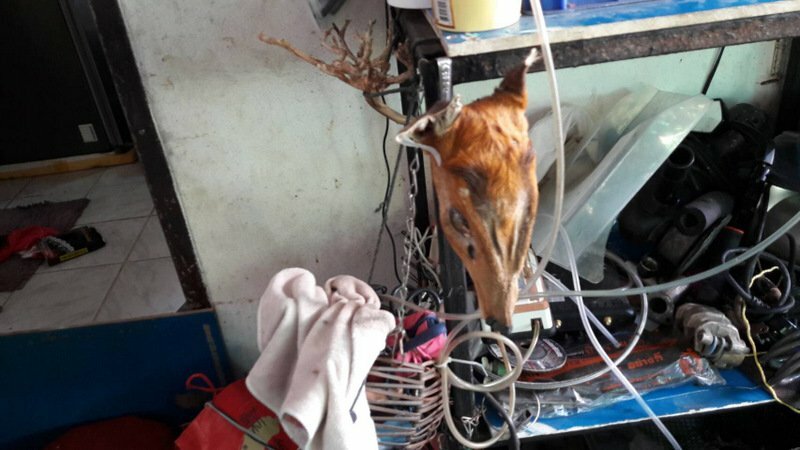 PHUKET: Police arrested a woman in Rawai yesterday (Mar 5) after a failed drug arrest led officials to the house she was staying and found in possession of a homemade gun fitted with a magazine, a stash of marijuana and a wildcat skin and a deer’s head. 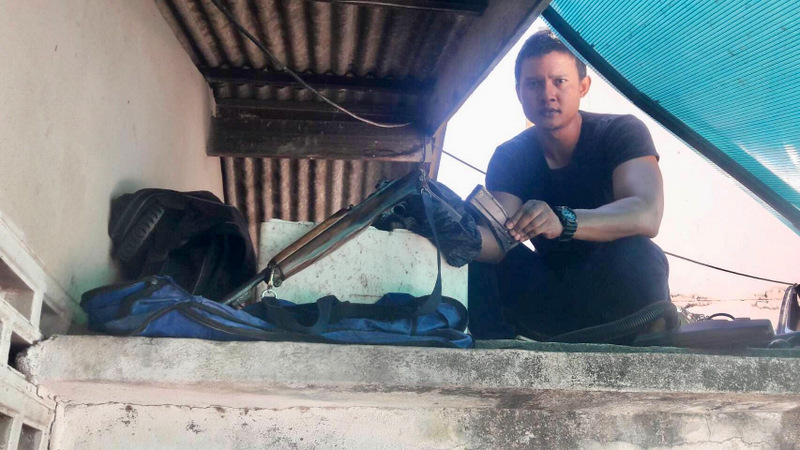 A team of officials from Muang Phuket District Office together with Maj Noppadon Piromboon of Region 8 Police arrested Anchalee Pantumas, 27, from Nakhon Sawan, at a house in Moo 2 Rawai. In the raid officials seized a polished homemade gun and 11 .30-calibre bullets, one wildcat skin, an ornamental dried deer’s head, three packs of dried marijuana weighing 112.86g, B103,500 cash and two BB guns that look like semi-automatic machine guns. 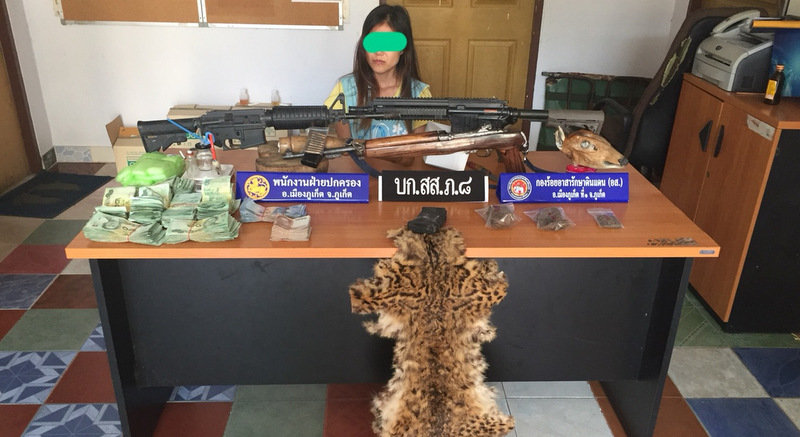 Anchalee was taken to Chalong Police Station and charged with possession of illegal firearms and ammunition, illegal possession of a Category 5 drug and illegal possession of carcasses of protected wildlife. 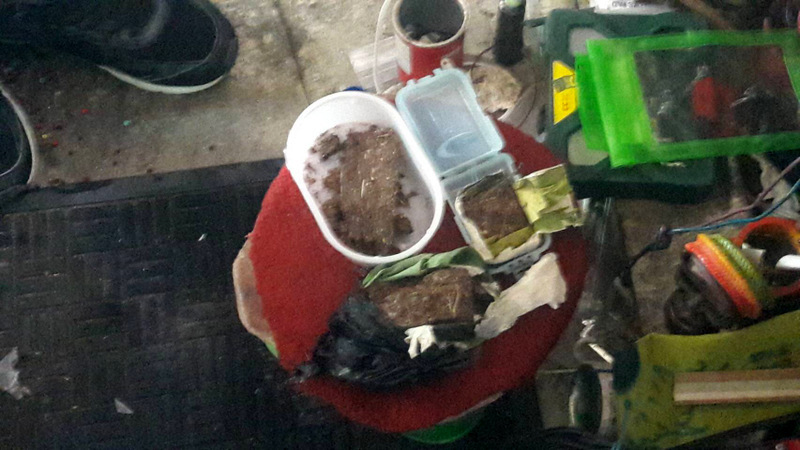 “The arrest came after officials received a tip-off that a man named ‘San’ was selling drugs,” explained Assistant District Chief Danai Jaikheng of the Muang Phuket District Office, who also led the raid yesterday. “San is a speedboat crewman. He goes to work and parks a speedboat off Rawai Beach every day. "He also sells drugs to other boat speedboat crewmen and to foreigners,” Mr Danai said. 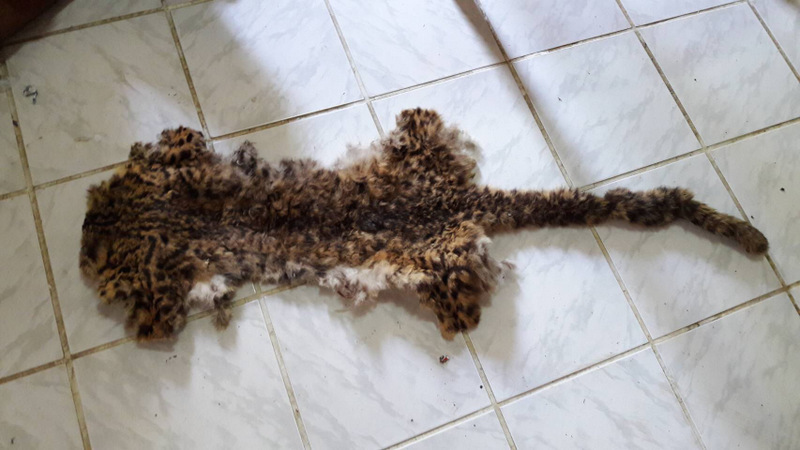 “On Friday (Mar 2) at about 5pm, officials went to Rawai Beach, but when San saw officials, he did not come to shore from the speedboat,” he explained. Officials then went to San’s house yesterday (Mar 5). “At 9:20am officials caught a suspect who was driving a motorbike from the house. The suspect told us that the people in the house sell drugs,” Mr Danai said. “San was driving a motorbike from his house with his friend on another motorbike. Officials followed them to Rawai Pier as we had received a tip-off that San was carrying drugs to sell at a speedboat. “San and his friend parked their motorbikes at Rawai Beach. Officials were unable to catch them as they moved very quickly to get onto the speedboat and took off from the pier,” he added. Officials then searched the house, and found Anchalee home alone with the items seized, Mr Danai noted. “Anchalee admitted the charges against her,” he added. Officials are now continuing their investigation to track down San and his friend, Mr Danai said. I bet she wishes she was the Chairman of a construction company right now! Well, it seems that Rawai speed boat crews are partly operating under influence of drugs. Such makes it easier to understand 'speed'boat collisions. Never heard that Rawai Beach boat drivers were tested for drugs. They got 1 now, but he is of course not the only supplier. There are similarities with the Premchai case. Let's see who goes to prison and who not.